We’re almost through the year, as far as reviewing is concerned. I promised no more than 26 and with what is now pending I think I will go over that. However, I have to make choices and I have a lot of things going, so after the list of reviews below is completed, I will not review any more this year. From next year, I’ll review what I want to review, or on very specific requests. No strutural plan anymore, since I have so much going on in my life that I can’t do a fixed review schedule, which I already noticed this year. But! 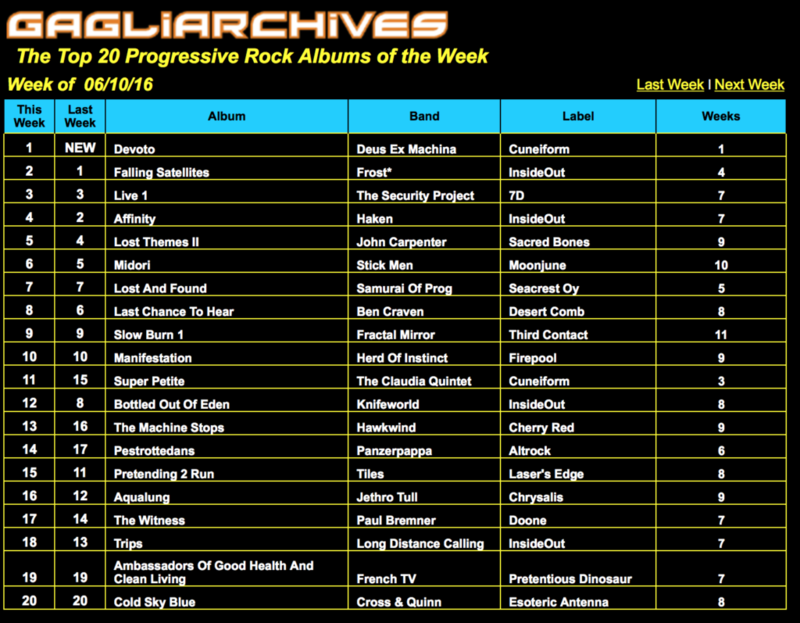 There will be airplay every week for any new artist that reaches my inbox, and soon there will be live interviews, all on ISCK Rock Radio in The Prog Files / Angelo’s Rock Orphanage. Wednesdays, 9PM-11PM CET, http://iskc.rocks. Even after two years of reviewing and putting stuff on internet radio, I run into bands I don’t know – and it looks like that is not going to change anytime soon. 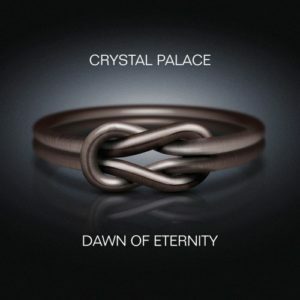 On the table right now is the album Dawn of Eternity by German prog rockers Crystal Palace. A band that’s been active since 1995 as far as album releases are concerned, releasing their debut about a year after their start in 1994. Eternal Step starts again with an almost metal guitar intro, and again a vocal part that reminds me of Dream Theater – actually this track has a similar, but softer, feel as Surrounded in places. The build up from the opening to the melodic guitar solo and the heavier ending is great on this track. And building up tracks is something that certainly characterises this album – it works on this track, but also on the very well arranged Fields of Conciousness, which starts with a melancholic guitar tune, then builds up via something close to alternative rock to a metal-like ending. The vocals on this one are emotional and very good. Word to the drummer also – for example on Heart of Sale, which has a slight echo on the upfront drums, which works well with the electronic sound of the keyboards and the guitar riff. An other great drum track is All of this, which is heavy and dark, but still melodic and contains a very well done guitar solo. Another track worth mentioning is Sky without Stars, which starts with a pulsating guitar and emotional vocals, until guitar, bass and drums join in to make it more powerful, without speeding up. As the music softens a bit halfway, the vocals beautifully reappear from the echoes, working toward a Porcupine Tree like soundscape at the end. 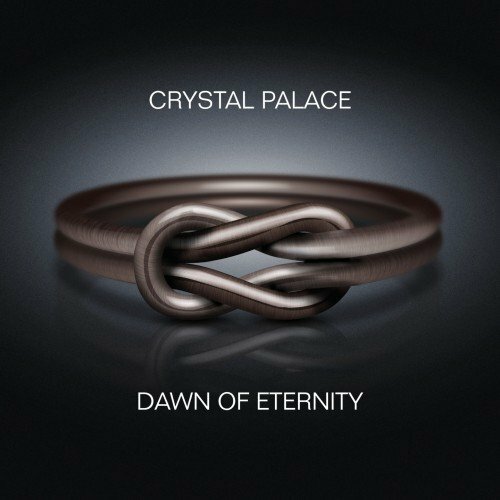 Crystal Palace are band with many influences, and they deliver a powerful album here. 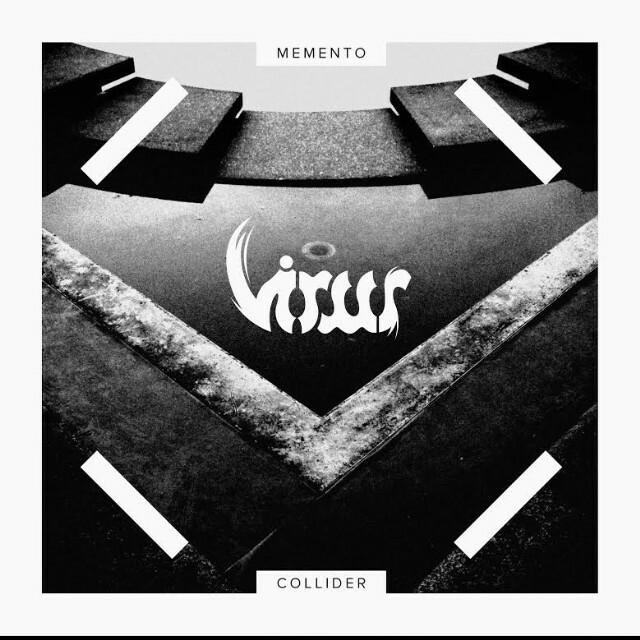 Probably not the biggest hit in the genre this year, but certainly recommended for fans of heavier progressive rock with 80s neo and 90s prog metal influences. The singer and drummer alone are already worth having a thorough listen. Having released four albums in 13 years, Virus is clearly a band that doesn’t focus on quantity of releases. This feeling gets stronger when you take into account that the length of their fourth, 2016, release Memento Collider is only 45 minutes long. The Norwegian band, headed by Carl-Michael Eide (vocals and guitars) has its roots in the Norwegian black metal scene of the 1990s, but have moved on quite a bit from there. On previous albums, their music was compared to that of for example Voivod and Cynic, but they also claim influences from the likes of Talking Heads and even Miles Davis. The latter is definitely not very present on this album, the others can easily be found when listening carefully. The remaining four tracks on the album do not all reach the level of the first two, in terms of darkness and variation, but none are bad. 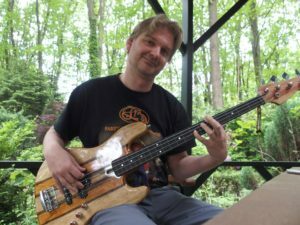 The bass is very prominent in all tracks, as are the sometimes frantic drums (Phantom Oil Slick!). Gravity Seeker, which lyrics are the source of the album title, has a slow, almost 80s new wave feel to it – with a heavier basis. All in all – for those who like the bands mentioned in this review, this is definitely a band to check out. The same holds for metal fans who want to hear what a metal band can do when they leave their core roots behind and start mixing in other things. One thing is for sure, in terms of progressiveness, this is a lot more original than all the Yes, Genesis and Pink Floyd derived material that is floating into our collections these days. None of it bad, but some refreshment for the ears is more than welcome. My first live show on Internet Radio! The first time live on air was fun, and a bit exciting. I’m off to bed, but enjoy the podcast in case you missed the show. Including an interview with Marek Arnold, of Seven Steps to the Green Door. 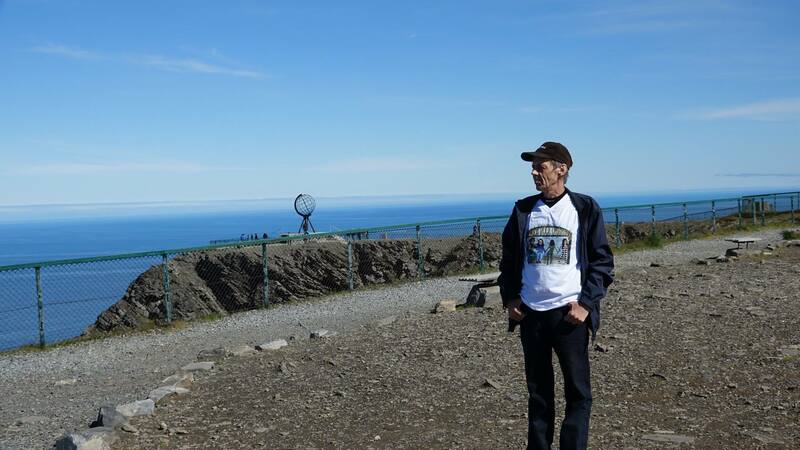 Osmo kept his promise, he photographed himself in an Angelo’s Rock Orphanage t-shirt at Nordkapp. Thanks very much Osmo!!! I also figured out the pricing, so those who contacted me will get a PM or e-mail soon. When I started using the name Angelo’s Rock Orphanage, Sonia Mota made a nice drawing that I used as a logo. This was nicely incorporated later in the Facebook banner for my radio shows and the header of this web site. As I posted earlier on Facebook, I also had a few t-shirts made based on this logo, one for myself, one for the artist herself, Duthc former prog reviewer and radio host Wouter van Hal, and very recently also for Osmo Jarvenpaa of Hullaballo Radio in Finnland and for Arianna Pernigoni at House of Prog. After posting about this last week, people strarted sending requests to buy one. I’m looking into making that affordable, and will keep you posted. 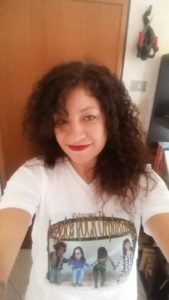 The shirts are high quality cotton, and if I do it price will be between 15 and 20 euro a piece. 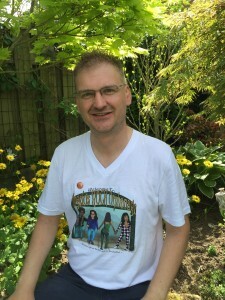 I would be interested to hear if that is an affordable price for a radio show / weblog t-shirt. Either way, it’s a fun gadget and I’m not making money from it, so I’m just going to make sure that if people want it, it is not going to cost me money either. Just let me know – thanks already!!! P.S. Osmo is going to photograph himself at Nordkapp wearing the t-shirt, and Wouter van Hal and Sonia Mota are sending their pictures in due time as well. All who wear one will end up in a big collage at some point…. Second week in a row I post this, because I’m trying to see how things develop over a period of a number of weeks, and partly because I think Tom Gagliardi’s show deserves to be promoted. 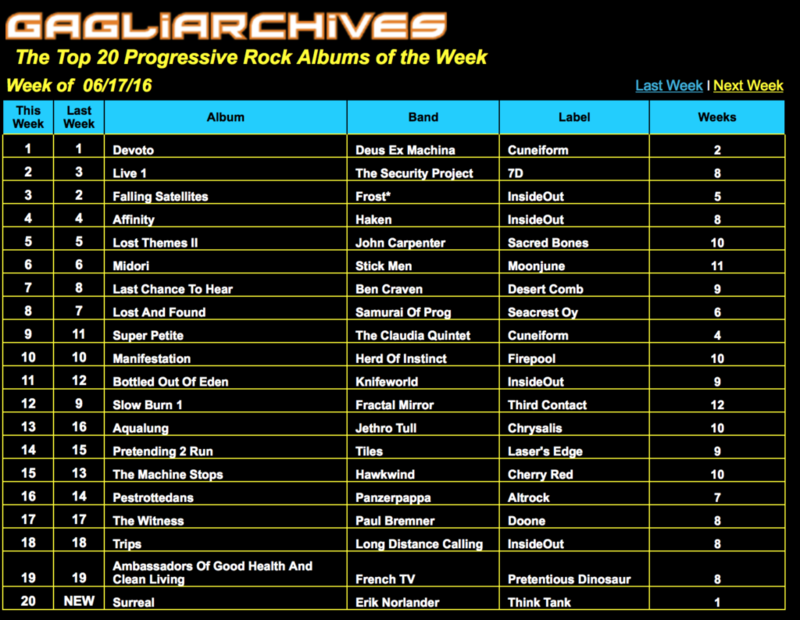 No idea if I’m going to post this here every week, but I was postively surprised by some entries in the Gagliarchives Top 20 for the week of June 10th, which I caught on Tom Gagliardi’s show this morning. Usually I don’t catch that programme, since it runs from 4AM-8AM local time on Sunday morning for me, but he had an extended show today, running till almost 9AM. Definitely a list to keep an eye on, even if you can’t catch Tom’s show. Once upon a time, in Germany, Oliver Rüsing formed a one person musical project and called in Karibow. Over time, the project became his full time occupation, recording material with a total worth of 17 albums. As a multi-instrumentalist (but originally a drummer), he composed, played and recorded everything himself, with an occasional guest musician showing up here and there. So what happened here? Easy: Oliver Rüsing composed 97 minutes of solid rock music, released on a double CD set. Music that moves him at big step forward from the AOR oriented Addicted, toward a more progressive rock approach. The AOR side of the music is still present on Holphinium, but the more complex and progressive line of F8 Al Ba6 and the emotional 9/16 continued on this this album. The overall sound is perhaps best described as a mix of IQ, Saga, Pendragon with a dash of Marillion. Here and there I even spotted a pinch of Iron Maiden to add even more spice. Holophinium consists of music that contains many layers, and each listen brings something new to the ear. One time it’s the keyboard, the next a bass run or a drum pattern – and there are many of the latter! Due to this, the tracks are varied, yet similar enough to make it possible to recgonise it is all Karibow. The title track sets the stage for the rest of the album when it comes to that: synth and keyboard driven vocal parts, almost symphonic, are interleaved with heavier, metal influenced instrumentals and changing drum patterns. My favourite track of the album E.G.O. brings even more of that. Almost a prog rock epic, lyrically dealing with the cause and downside of egocentricity, and the need to reach out and love others than yourself as well. Oliver Rüsing brought in two external vocalists on this album (Michael Sadler on Rivers and Karsten Stiers on Orbital Spirits), but using his own low, 80s influenced voice on this one was the best choice. Next to these I was most happy with the have-the-audience-sing-along-but-not-a-pop-rock-track Victims of Light, the beautiful River, and Quantum Leap, which has a hypnotic drum pattern and great keyboard work by Sean Timms of Unitopia and Southern Empire. All of these, and more, are on the more than enjoyable first CD of the set, called Fragments. The second CD contains what is advertised as a single, 36 minute track, consisting of 7 parts: Letter from the White Room. 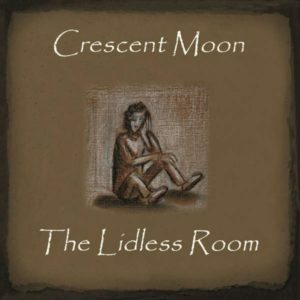 The lyrics (or part of them) form a letter, written from the perspective of an astronaut in the white room, the room from which they enter a space craft before launch. This 36 minute piece could have been an album in itself, and is even more layered and complicated in structure than the first CD. Moon starts as an almost vocal only introduction, followed by Walk on Water with an Iron Maiden like guitar riff, and then the ‘suite’ builds up in heaviness throughout the 4 parts – with beautiful interplay between all instruments – until it drops back to a slow, question endon Plutionian. So, this is the perfect album then? No. I’m not going to let Karibow get away with this – if only because even though Oliver has been on it for almost 20 years, Karibow have only just begun. There are small flaws, and I would love to see them do an album as a band, not having everything done by Oliver himself. So, putting on a little bit of pressure here. But apart from a few small things, the only real issue I have with the album is it’s length. I started playing it as two separate CDs, because 97 minutes really is a long time to listen to one album. Given that Letter from the White Room is almost an album by itself, it’s not a big deal though – we got two album for the price of one. 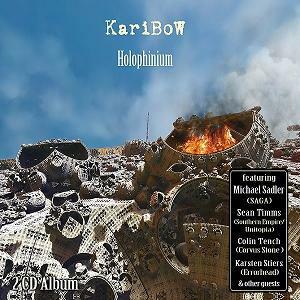 Now let’s have Karibow enjoy life on stage, and with a bit of luck we’ll get another album from them in 2017 or 2018. Definitely highly recommended! Twenty years ago, I could not have imagined having made as many friends through Facebook and other social media as I did in the past 18 months. By posting album reviews, and 9 months ago adding an internet radio show as well. It put me in contact with people that like the same music, share the same dreams and to some extend have the same fears. Fears that include losing our freedom and privacy to the net, while being (un)consciously aware of the fact that it is us, ourselves, giving up these things by being active on the net. until the moment he gets rid of his VR glasses and smart phone. His mental road from arriving there until realising that is captured in music that sometimes resembles that of 70’s Pink Floyd (Roger Waters certainly was an influence), but is by no means a copy of that. Especially the vocals on Obsolete Man remind me of Eclipse, from Dark Side of the Moon). With outstanding tracks like Aphids and Ants (melody written by Bas at age 13), The Lidless Room itself and the closing instrumental Through the Gate, the foursome proves to be more than average musical family. The music is atmospheric, with the keyboards often carrying the rest of the band through the instrumentals. To add to their credits, the band has taken a very professional approach to creating this album. They built their own studio at home, played, mixed and produced everything themselves, and have a great eye for detail. Proof of the latter: One part of the story tells about the man sitting in front of the gate remembering playing his first LP. Sure enough, the back cover of the CD nicely divides the 11 tracks over Side 1 and Side 2 in reference to that. Happy to know these musicians, by their music and their regular attendance to the chat of my radio show. But even without knowing them that well, this album deserves to be qualified as highly recommended. 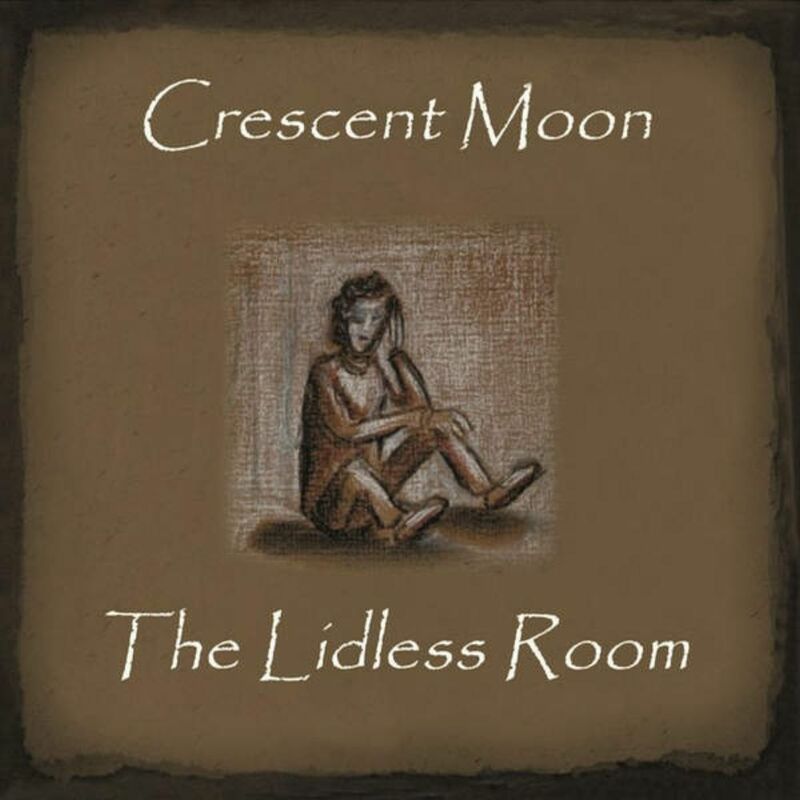 Crescent Moon delivers progressive rock inspired by the classics, without becoming a copy of one of the classic era bands.